The 2X4 brick was introduced in 1949 and is one of the two original LEGO bricks.. The first type (2X4vs01) is illustrated above (but see also this alternate candidate to the honor of being the first type). There are no inscriptions on the bricks (logo or mold number) and thus they may be confused with unbranded products of other origins. When seen from below, the inside corners are very rounded. This is an important distinguishing feature. There were only mold units for two types of bricks: with a single lateral slot; and with two opposing lateral slots. The mold had at least five units: three for double slotted bricks and two for single slotted bricks. These may be told apart because the molding pip is on opposite sides of the slot. In the first issues (from 1949 to 1951?) the bricks were molded with a distinctive catalin-type resin not used subsquently. They do not warp, are very shiny, and have a milky aspect and, as in all plastics of this type, they show considerable transparency against a soft light, even the white coloured bricks. NOTE: In LEGO bricks the slots are molded and not cut and thus the same molding unit always produces the same type of slotted brick. 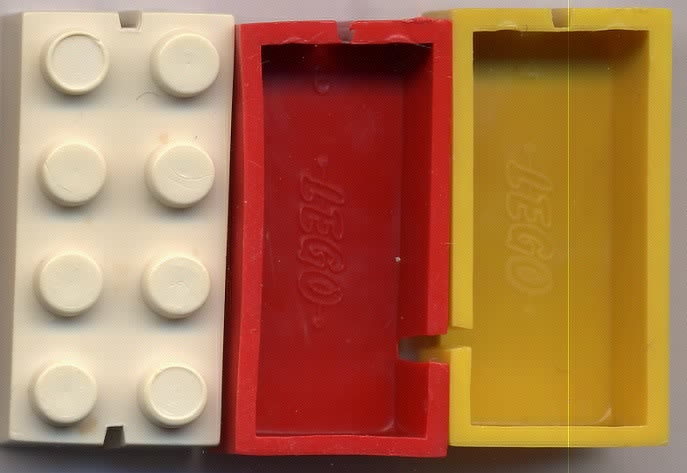 When a new mold was needed The brand name "LEGO" was conspicuously carved in the mold. This may suggest a need to diferentiate from immitators. Since the10X20 thin baseplate issued in 1951 was not similarly marked, this mold is more recent. No mold unit numbers are engraved. Seen from below, the corners are only slightly rounded (much less than vs01). Looking from beneath into the brick interior, thin longitudinal ribs will be noticed. These were probably carved in the mold to help with the ejection process. Bessides 2X4vs01, this is the only other mold used for 2X4 colours that had been abandoned by 1953, such as light green and marbleized. 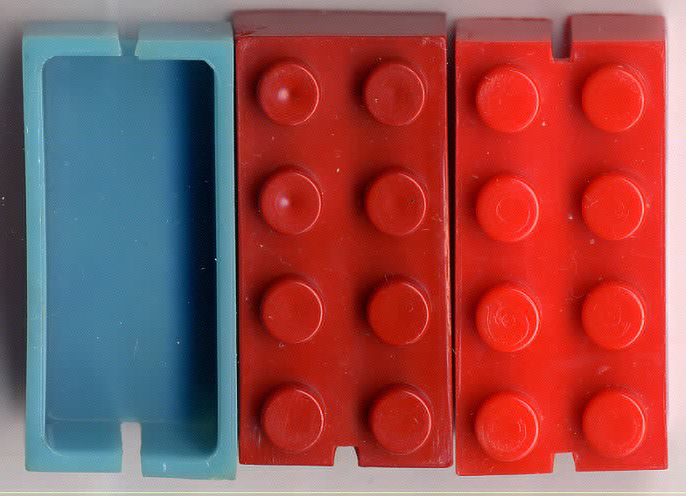 A comparative study of colours and plastic characteristics shows that the mold 2X4vs01 was not abandoned at this time and both molds were used simultaneously. Molds were made at this time again to produce only the single slotted bricks and the opposed slotted bricks. The first 3X4 mold was produced at the same time as this. This is a different mold from the previous . 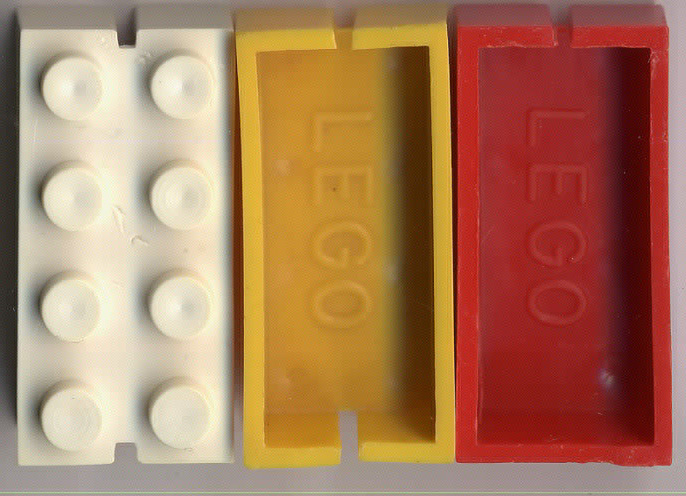 Seen from beneath, the interior ribs are transversal and not longitudinal (they are clearly seen on one of the sides of the interior of the red, the blue and the yellow bricks). This mold had two life-phases. 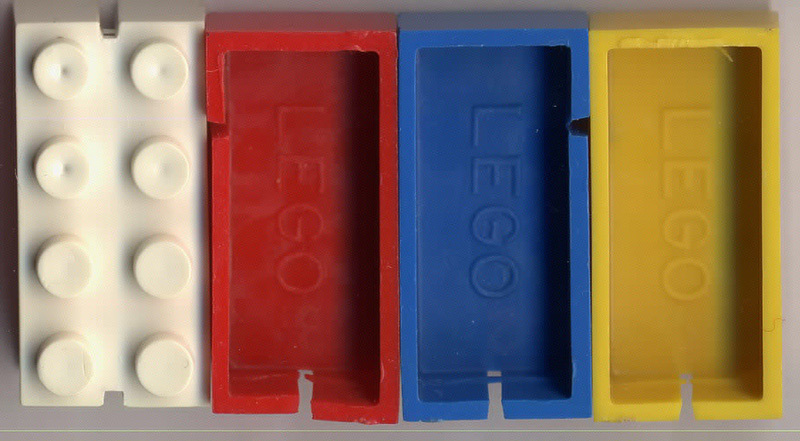 Originally the letters of the "LEGO" logo were less marked and the molds were not numbered. 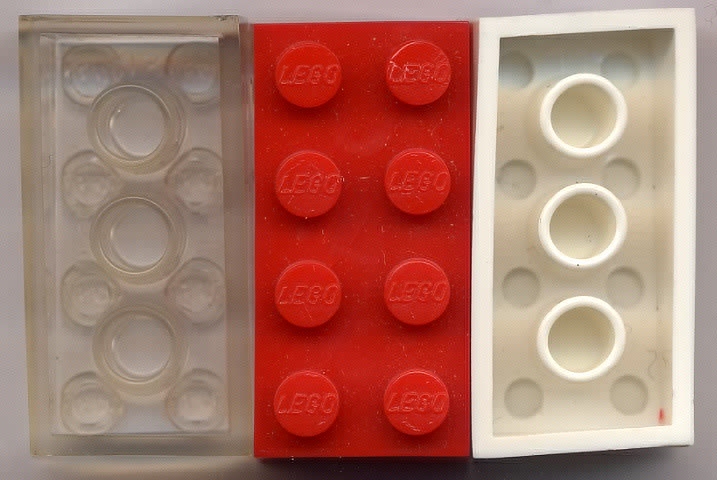 Subsequently the LEGO logo was deepened and molds were hand inscribed so that each brick was marked with a faint mold number (the red brick in the figure above is "3", just visible upside down in the lower part of the brick). -mold nr 3- slots at 90º as the red brick above. Circa 1954 a new mold was produced. Bricks were still slotted and mold units were made to produce all four slot combinations. The main difference is now the so-called LEGO "dogbone" logo engraved inside. Seen from above, the sides of some studs are seen to be taller than the top- see the two diametrally opposed studs of the white brick in the picture above. This is a result of using ejector pins on the cavity side of the mold, one over each of the two studs. The marks are seemingly caused by an intrusion of plastic on the periphery of the ejector pin tops. Machine-engraved neat mold numbers were used (partially seen on top of the yellow and red bricks above). -Nr 7 and 8 - two opposing slots. NOTE: The very first boxed sets sold in Germany in the Winter of 1955/56 had this kind of bricks in red and white. The problem with the concavity of the stud surfaces on high speed injection molding, seen e.g. 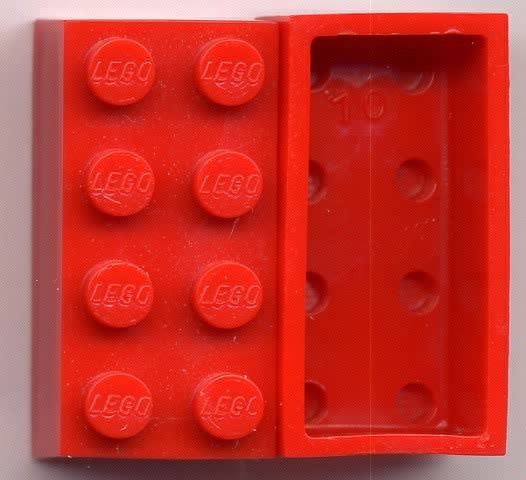 on the 1X2 bricks, called for thinner stud walls, and so in the first molds for non-slotted bricks produced by LEGO, the studs were hollowed. Another feature was introduced in all the new molds: the "LEGO" logo on the studs. There were at least two molds made, but their differences do not justify type status. In one the mold unit numbers are printed at the top; in the other they are printed at the center but from right to left (as if seen in a mirror). Mold numbers seen: top printed- "1" to "19" and there are also unnumbered bricks; center printed- "1" to "18". Bricks of this type were certainly sold in 1956-57 in Scandinavia and also in Germany in 1956, but were not seen in sets sold in Portugal. NOTE: Blue and yellow bricks are unusual and green must be quite rare- I only know it from an image sent by fellow collector Maxx Kroes. The fifth version of the 2X4 brick is easily distinguished by the underside tubes that connect firmly each brick with the brick below. The studs are hollow with a diameter of circa 3mm, as in the previous version. All bricks bear underside the note "Pat. pend." above and below the central tube. Mold numbers seen are "1" to "20". This was the first type confirmed sold in Portugal from 1957/58. New molds were introduced circa 1960. These are distinguished by the smaller diameter hollow of the studs, correcting a possible fragility of the previous version. Stud hollows are encircled by a ring, likely the imprint of ejector pins in the mold. The first mold or molds were identified by a number only, subsequent molds identified by a code consisting of a number and a letter on opposite sides of the underneath.